El Mago De Las Fritas is located on 8th street in Miami. It’s not the only frita place on 8th street though. Approximately 10 years ago on my way home from my parent’s house, I came across El Mago De Las Fritas. The first few times I attempted to stop here, there were no parking spaces available (there are only 3 spots). One day I was finally able to find a parking space and taste their Frita. I regret not having made the effort to find parking sooner elsewhere. Do not park in one of the 3 reserved spots unless of course, you are eating there. If you do, you might witness El Mago (yes, the owner is really referred to like this, it means “Magician”) going outside and screaming at them to move their cars with a spatula in hand. He’s too awesome. You must, of course, order the Frita. 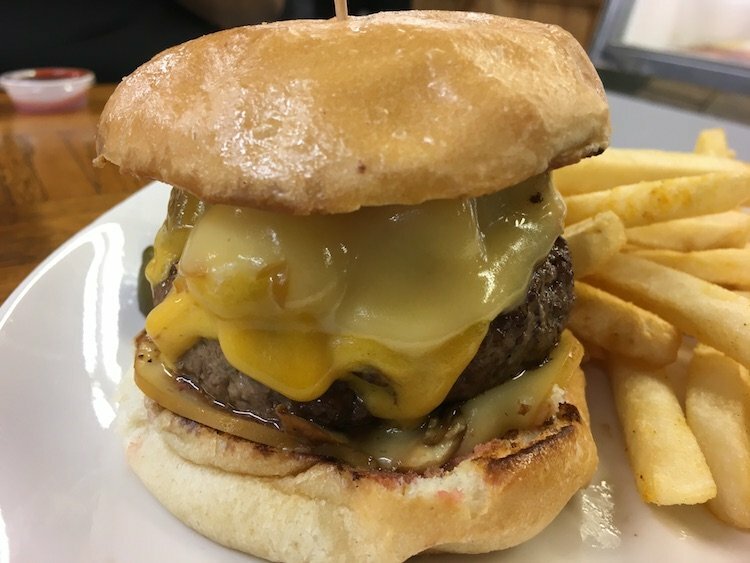 A Frita or Cuban Hamburger is usually a combination of ground Beef, Chorizo, and spices topped with Onions, homemade Julienne Potatoes, and Ketchup (not always) on a Cuban Bread Roll. El Mago claims there is no Chorizo in his frita but I don’t believe him. The Frita has a very distinct flavor and will cause a flavor explosion in your mouth. There is no burger that tastes anything like this. And don’t get your Frita with cheese, unless you want to look like a tourist. I’d be lying if I didn’t tell you the Frita with cheese is good but nothing beats the original. You can also order a Frita Doble (double meat) or Frita a Caballo (with a fried egg). They’re all delicious. You must also make sure to order the fries at El Mago de las Fritas, there’s something very high school about them. Fritas aren’t the only thing on the menu here. El Mago makes a mean Pan con Bistec (Steak Sandwich) with the julienne Potatoes & Onions. The Pan con Tortilla Calljera (Omelet Sandwich) with Ham, Cheese, Julienne Potatoes and Onions is another winner. On Saturdays, he makes Chicharrones (Fried Pork Rinds) & Ajiaco (Beef & Veggie Stew). Remember that his homemade Flan is also great but don’t get ahead of yourself. Start with a Frita because this is the best Frita in town hands down! You and your damn fritas…pssst. I have to comment on the BEST frita outside of Cuba.For the old cubans, they remember la Plaza del Vapor where a lot of food carts use to sell all kind of food.Their fritas were owesome. El Mago have those fritas.I used to have my auto parts next to him so I know. About the greasie and rough, that's the way to eat them, is nothing that a 400 degree heat couldn't kill. If you have a chance stop and get a frita from El Mago. If you think that the fritas there are good, the pan con bistec will blow your mind. This steak sandwich topped with the same thin fries is awsome. I think it is even better than the fritas. One (maybe two) Frita a Caballo please. How do you not eat this daily? If you guys think this frita is good you obviously haven't tried El Rey de Las Fritas which blows El Mago away!!! El Mago's fritas are ok but there's no comparison! another place of note is Fritas Domino. it's on 8th street anbd 68th avenue. the last store on the shopping strip. it's a dive but DAMN those are some good fritas. they do al the regular ones, too. As a Jewish guy from Brooklyn, there are some things I just dont get. Once I took a non Jewish girlfriend to Rascal House, and as if in a Woody Allen movie she ordered a pastrami sandwhich on white bread with mayo. She simply could not get the rye bread concept. I was very excited to go to this place as it is very close to where I work. I ordered the Frita with cheese and the pan con bistec. the thing is i dont get the bread? Why take a perfectly good bread and flatten and harden it? Its a cultural thing me thinks. I thought it very good, as this was my first fritas i didnt know what to expect. worth having again, but i dont have a sentimental attachment. The bistec, ultra salty, but good, also worth having again. The fries nothing special. They are not open on sundays, so my chances of getting the chicarhones are nil. Not bad, but i t hink i lack the cultural attachement to find this place amazing. The Chicharrones are Saturday though.